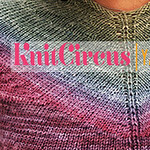 Knitcircus Yarns is pleased as punch to present the Gradient Yoke Sweater Pattern, designed by Amy Detjen. This sweater gives you an exciting and unusual construction; a top-down v-neck raglan. Designed to make the most of a self-striping handpaint, the yoke uses just one skein of gradient yarn, surrounded by coordinating kettle dyes for the body and sleeves. 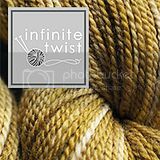 Let our yarn do the color changes for you! Gigi has been working on her Braidsmaid by Martina Behm, out of Abstract Fiber in Lima in the Hibiscus colorway, and is worried about running out of yarn. Jasmin mentions that Knitty had a lovely Brioche cowl and she has it queued. 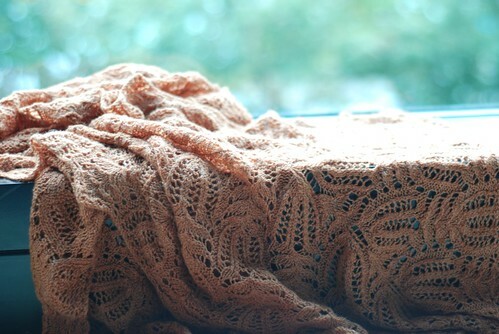 She mentioned New Lace Knitting , by Romi Hill that we reviewed last week. Also, Miss Babs just came out with a Polydactyl (not Pterodactyl) kit. She also mentions the gradient kits she bought from Black Trillium Fiber. Gigi has her next Braidsmaid lined up, with yarn from Sarah of the former Cephalopod Yarns. Jasmin is working on installing the zipper on her Elsa Sweater and is using finishing books for reference. She is looking at Big Book of Knitting , Nancy Wiseman's The Knitter's Book of Finishing Techniques , and Lucy Neatby's Cool Knitters Finish in Style. Gigi is churning out preemie hats assembly line style. Jasmin is making progress on her Bifrost Scarf and she mentions two cowls she knit out of Canon Hand Dyes, the Striped Cowl and the Rainbow Dots Cowl. We talk about the meditative aspect of knitting. Jasmin thinks we should ask Dr Gemma of the Cognitive Podcast about knitting as meditation. Jasmin loves cutting her knitting for steeking. Gigi is working on a sock yarn blanket out of leftover sock yarn. Jasmin has started a new cardigan for Genevieve, the Gingersnap cardigan. Gigi is going to knit an Olivia cardigan out of this pattern for Genevieve. Gigi has worn her Flamingo Feathers, and her Swallowtail. And sparkly socks. Genevieve wore her Duck Sweater, Jasmin found more duck buttons at Affordable Treasures, and she found an afterthought buttonhole in one of Elizabeth Zimmerman's books (Knitting Without Tears ). (Jasmin did, not Genevieve). She wore the Quin hat and the Molly hat that KnittyBarb made for her. Rex wore his Little Baby Sweater, and a Pumpkin hat that one of the knitting aunties made. We have an etiquette question, whether an internet picture with a note is acceptable instead of a handwritten thank you note. The Grinch-along. Starting date December 1st. about what to do with leftover yarn.Gigi mentions the leftover sock yarn pattern. Also, she mentions NICUs looking for preemie blankets the size of an 8.5x11 size of paper. Let us know what you do with left over yarn. Gigi knitted with some leftover swap yarn that squeaked at her. Jasmin was working on the Elsa cardigan and didn't like her hand sewing. Jasmin mentions her Einstein coat. Also, we are very fond of Thimble-It Finger Pads . 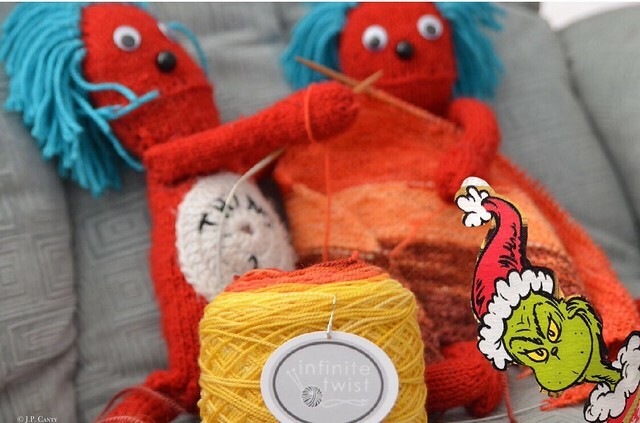 Erin.Lane Bags and Holiday Yarns are teaming up to bring you a very special knitting club in 2016. “A Year of Winter That Ends With Christmas” is based on the beloved story, The Lion, the Witch, and the Wardrobe, and brings you six project kits representing characters from the book, complete with an Erin.Lane Project Bag featuring exclusively designed fabric. This club is designed with everyone in mind, and the 12 automatic and equal monthly payments make the decision to sign up easy and quick. All subscribers get a special ornament mini-project and have the option to add-on an exclusive seventh project that represents the dreaded White Witch and her chilled persona. Visit erinlanebags.com before December 15 to sign up and enjoy your year of winter that ends with Christmas. One Minute Update: Jasmin won the Stash Dash competition with Notre Dame Jen, NDJen04 of the Commuter Knitter podcast, and two days later had her baby. 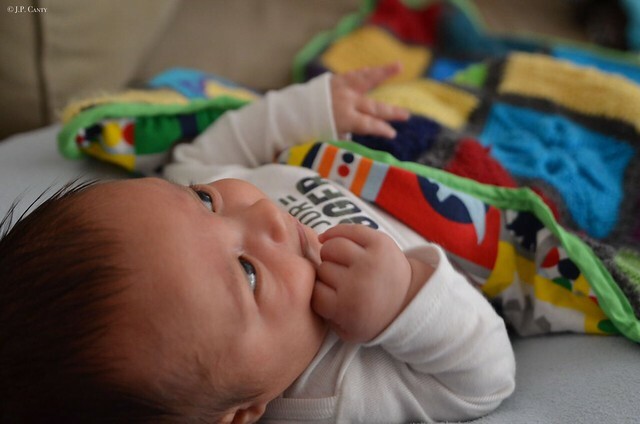 Thank you so much for the Loveblanket for Rex! Jasmin has finished objects, the finished the Dinosaur Hat, two Playful Stripes cardigans, one for Genevieve, and one for Rex. 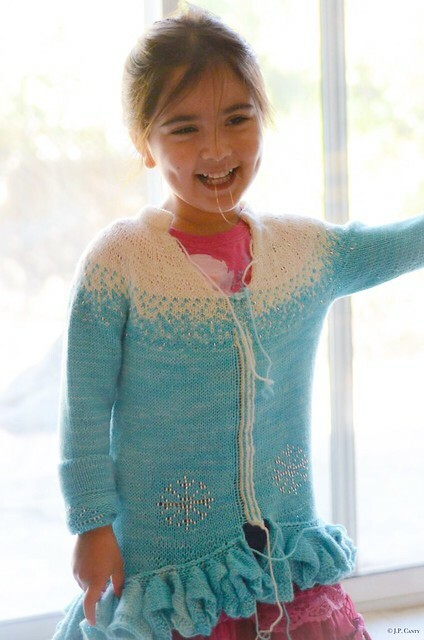 Jasmin has been working on the Elsa Sweater, all info and mods are on her project page. The ruffle is lifted from Jean Moss' book Sculptured Knits. Elsa is a character from the movie Frozen . The sweater has beaded snowflakes, a rhinestone zipper, everything. Gigi has knitted a set of Sibling Socks, out of Regia 6 Ply . She also started another Braidsmaid and ordered yarn for yet another one. So we ordered yarn from Sarah, formerly of Cephalopod Yarn, in Bugga in a lovely denim blue. Gigi thinks she is doing a personal #Behmalong. Jasmin has finished a bunch of small sweaters: She is working on finishing a Gramps cardigan from Tot Toppers, out of Sheepspot Suffolk Worsted in the Vitamin C colorway. Jasmin soaked it in SOAK woolwash and then used hair conditioner to soften the yarn. She has another Gramps cardigan in the works, this one by Tin Can Knits in a sock monkey adaptation, out of Cascade 220. She also has cast on a Bifrost scarf by Infinite Twist. They also sent a Fish Sock Kit for Gigi. Jasmin is also knitting a Playdate cardigan by Tin Can Knits out of Fibernymph DyeWorks "Star Trekkie" Also finished a Purl Soho Sweater for Rex out of Berry Colorful Yarnings. Gigi has been cranking out preemie hats, and she has started a sock yarn blanket. "Welcome to our new FALL craftalong ElvesWorkshopalong! Alicia and I are so very excited to finally share this with you! The main idea of the ElvesWorkshopAlong is to encourage us all to create handmade gifts early enough so we can enjoy our Holiday season and avoid racing to finish our gifts at the last min. The ElvesWorkshopalong will begin September 1st and run until November 30th. Each project must be cast on and finished within this time frame. Crafters will be able to submit as many entries as you wish. Your entry can be any finished crafted object of your choice. Some examples of entries can include knit, crochet, sew, woodworking, modpodge, baking, etc. If it’s a handmade gift, it qualifies! You will see a locked FO thread which will open once the along begins Sept 1st. We’ll have a form you can quickly fill out to enter each of your finished entries to win prizes! We have already had some prizes donated. Stay tuned for a sneak peek of prizes in the ravelry thread as well as discussed on the podcast! We will pick prizes for those that post pictures on social media using the tag #elvesworkshopalong." The three prizes for the #grinchbomb contest are (so far) three Grinch project bags (sewn by us, never for sale) paired with some lovely Coloring Book Yarn. about the Citric Acid Soak for color work. Jasmin really likes the unscented SOAK woolwash , as well as the soak from Unicorn. She mentions her Elsa cardigan, and the Rainbow Dots cowl. Gigi used smaller needles on her 1000 Tulips shawl, This changed the gauge and now the shawl isn't wide enough, so she is going to pull some of it back and knit it longer. Jasmin sewed shanks on the backing buttons of the new Playful Stripes cardigan. This week we purloin from the Awesome Etiquette podcast hosted by Lizzy Post and Daniel Post-Senning to discuss how to politely let a podcaster know that certain things detract from the listening experience. We also mention the Savage Love Podcast, which is not family friendly. Jasmin mentions Emily Post's Etiquette , by Peggy Post. Genevieve joins us briefly to talk about her weaving, spinning, and knitting. 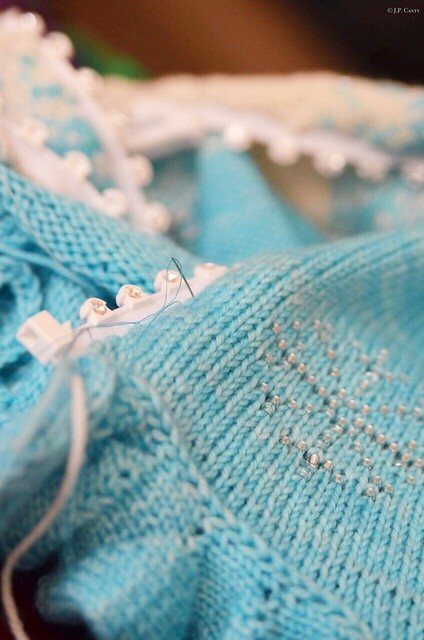 Gigi has been working on the turquoise summer dress she is sewing for Genevieve. She thinks she needs to work on improving her technique for lining garments. You can find Charlene's designs on Ravelry here.